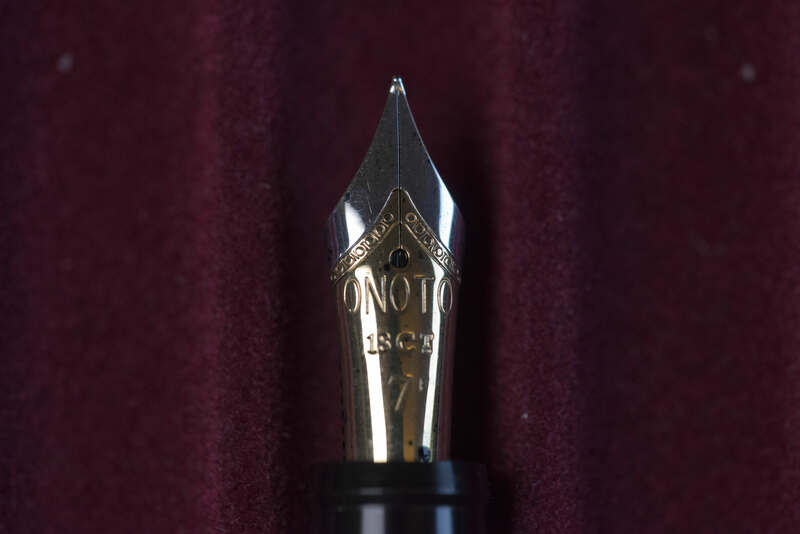 Onoto was a brand created by De La Rue in 1905 for the manufacture of quality fountain pens, first in London, then in Scotland, and now in Norwich. 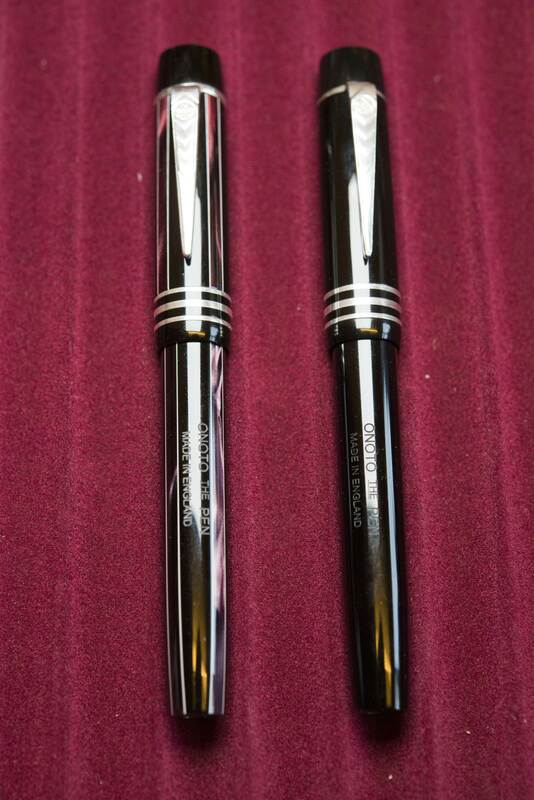 During that time one of their most successful models was the Magna, also known as ‘The Pen’. 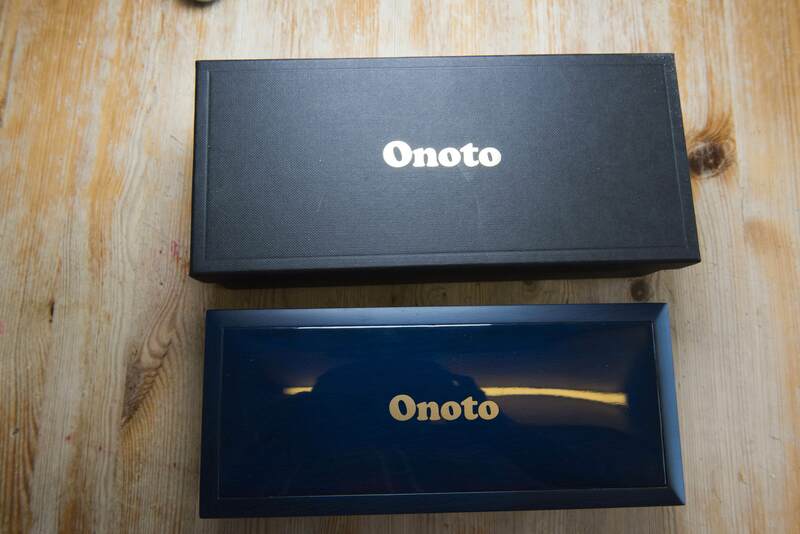 For more information on the brand and its history please see the company website at https://onoto.com/the-onoto-history/, else it will take up too much space here. 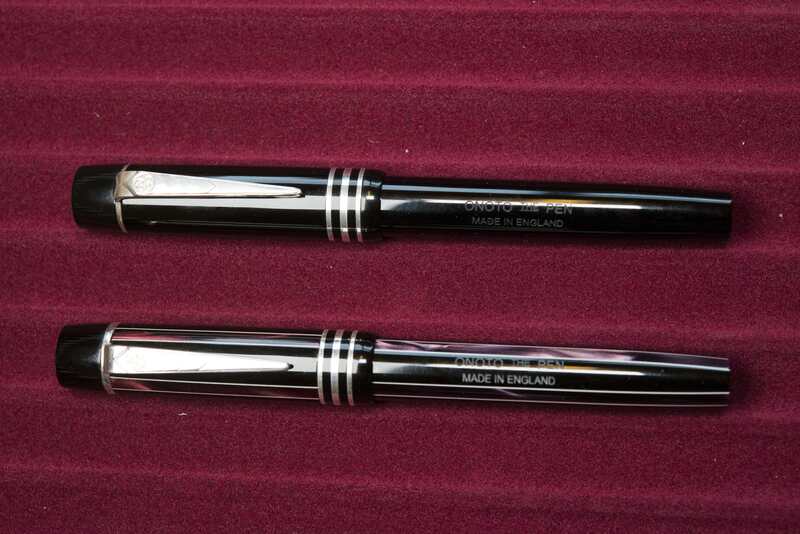 Needless to say, after a period of serious trouble and very low sales, the company was taken over by a fan in 2005 and in 2010 the Magna Classic was brought out, harking back to the classic pen. Numerous models have been based on this design, all hand crafted and with steel nibs by default, gold as an option. Presently, as of late 2018, Onoto are moving from using Bock nibs to Jowo (visually identical). At some point I decided that I would over time purchase one of each of the three traditional British brands, Conway Stewart, Onoto, and Yard-O-Led, but with no time limits set. Late in 2017 I found a very good deal going for an Onoto Magna Classic with fine gold nib at La Couronne du Comte and so I jumped at it. This led me to approach the Onoto stall at the October 2018 London Writing Equipment Show with a view of seeing if there were any bargains. There were, and I picked up a prototype Chuzzelwit pen, this time with a steel nib. 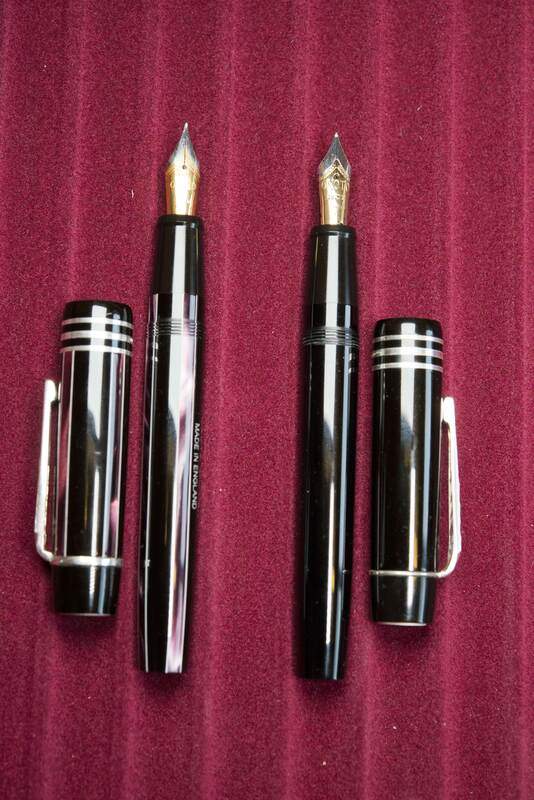 As the latter is based on the Magna Classic I’ve decided to review both pens together. First impressions are rather contrary. 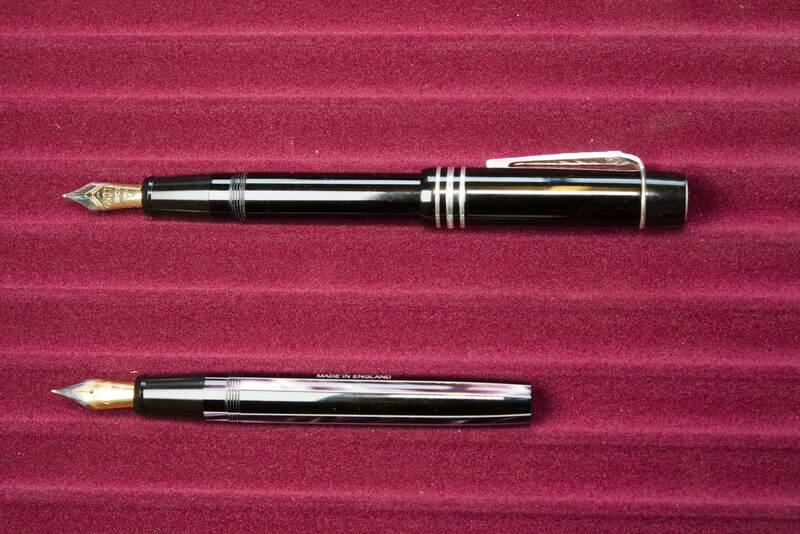 The pen looks quite small, but as can be seen from the comparison with the Lamy Safari, it is not. It is light, though there is a cost option for an additional weight to be added. It looks dated, but that is by design. In the hand it is very comfortable and I found it to be very well balanced (note I use the classic tripod grip and hold the pen comparatively far forwards). Amongst the modern, cigar shaped generic pens it stands out as looking classically British. The material is a light weight acrylic, which feel and weight wise is reminiscent of a certain Germanic ‘precious resin’. It is nice to touch, and like its German rival, does not feel cheap. The barrel is imprinted with ONOTO THE PEN on one line and MADE IN ENGLAND on a second, just like on the original Magnas. When the cap is on, this lines up nicely with the clip. The Chuzzelwit has four pearlescent purple strips with white borders at ninety degrees to each other going down the length of the cap and barrel, with two nicely bracketing the clip and branding. It really does stand out and is very attractive. The lines do match up between the cap and barrel. The cap is wider than the body and has three bands (traditional to Onoto) towards the opening. These are sterling silver on both of mine, with a hallmark on the middle band on the opposite side to the clip. 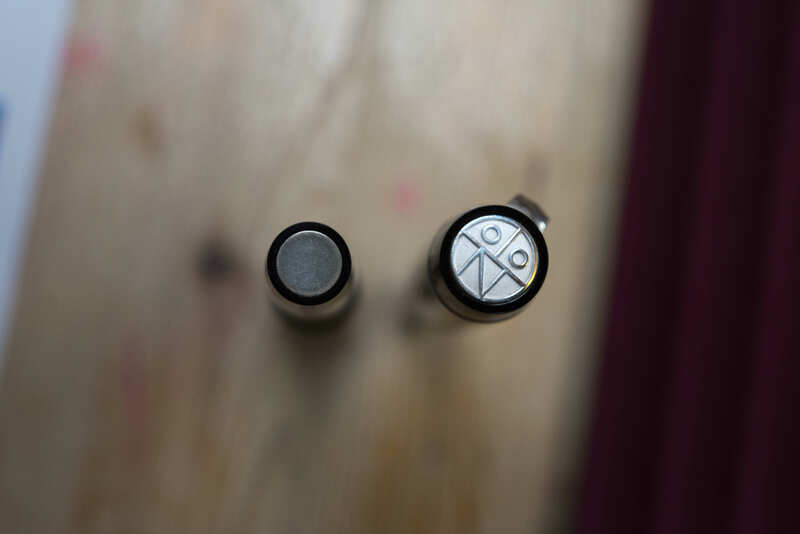 The finial has one of the traditional Onoto logos on it and again is sterling silver. The base finial is a plain silver disk. The clip band again looks traditional and the clip itself is also reminiscent of an earlier age (though when looking at vintage pens on eBay it appears to actually be a modern design). On the Magna Classic this clip I believe is silver plated – I can’t see it being solid silver as that would bend quite quickly. It flexes and works well. On the Chuzzelwit the furnishing are the same, however being a prototype, looking at the present model, it has gold plated fittings. Personally I actually prefer it in silver. The clip on the latter is extremely stiff and I had to gently prize it open slightly. This is one of the risks of buying one of their prototypes at the show as they can be flawed, but you are also paying a lot less for them, in this case £300 compared to the £499 the production model would have cost me. Key thing with these is you need to inspect and try these pens, something they do actually encourage. As I normally do not pocket pens (or rather rarely) it was actually an area I did not think to check. The cap does post securely and adds significant length, but it also back weighs the pen moving the balance point back by about an inch. Personally I prefer to leave my pens unposted and it is long enough that this is not a problem. It takes just over 3.5 turns to remove the cap, which for some people will be too much, but the pen has just a single thread, which allows the branding, and on the Chuzzelwit, the lines, to be in the correct position when closed. Uncapped, again the pen looks dated, with fine threads part way up the barrel, about a centimetre back from the grip section. The grip itself is angled down by about 15 degrees with gentle tapering, then reaching a thick ridge, though this too is angled on its edge. Moving your fingers along the threads you can feel them, however when the pen is held for writing they cannot be noticed. 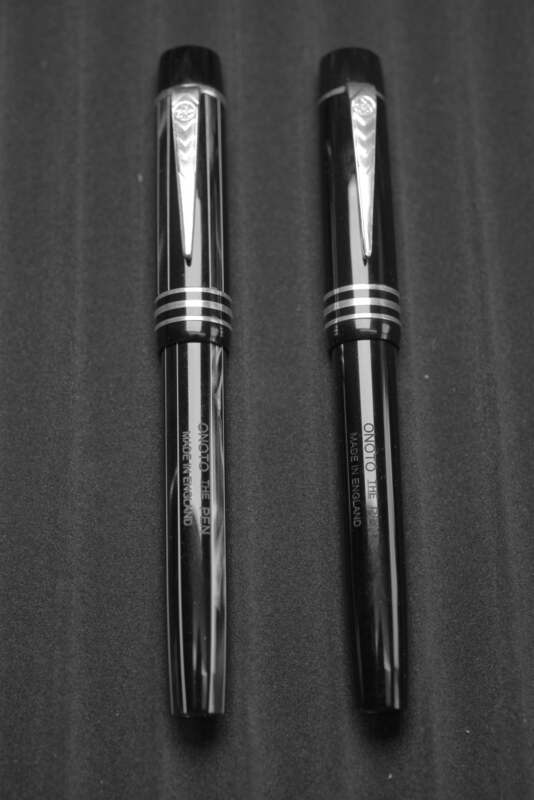 It is very pleasant to grip and there is no one position by which the pen must be held, rather it allows the user to find the perfect width without having to think about it, again adding to the comfort. The pen comes with an unbranded standard international converter, which fits securely. It will also take cartridges (international short and long) if need be, though none are provided. The nibs themselves are size 7. Not having (yet) an original Onoto pen I do not know if this was a traditional size or a design option made when the company was effectively restarted. Visually it works well, and this might be the reason behind the pen looking smaller than it is. The gold nib is relatively stiff but does produce a little bounce and is a wonderful writer. The steel nib is again smooth and buttery, though at the pen show I found a noticeable difference between the fine (old stock Bock) and the medium (new stock Jowo). 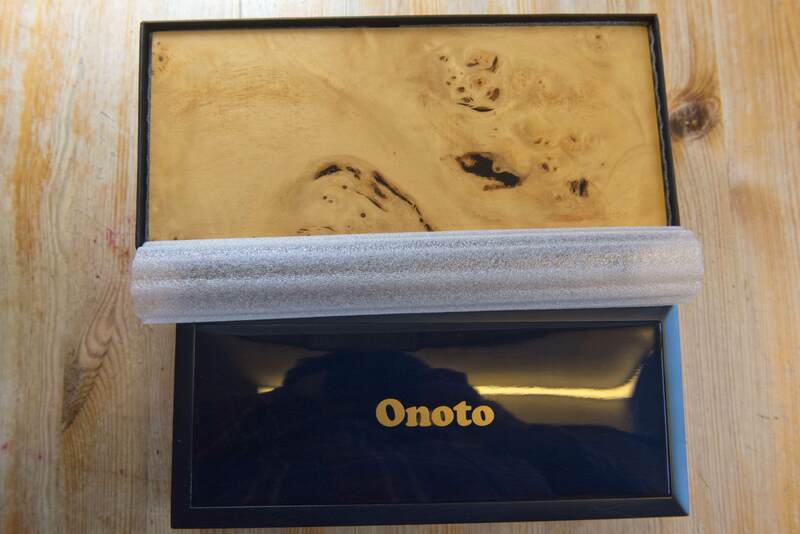 Onoto have recently changed supplier, and while branded as well being an unusual size (as well as being tested and tuned by Onoto) the core material of the nibs may be the same as the standard generic ones from the two manufacturers. Needless to say the writing experience is really nice and I’m not sure there is that much difference between the gold (older Bock) and the newer Jowo steel nibs. This does raise one gripe of mine though. 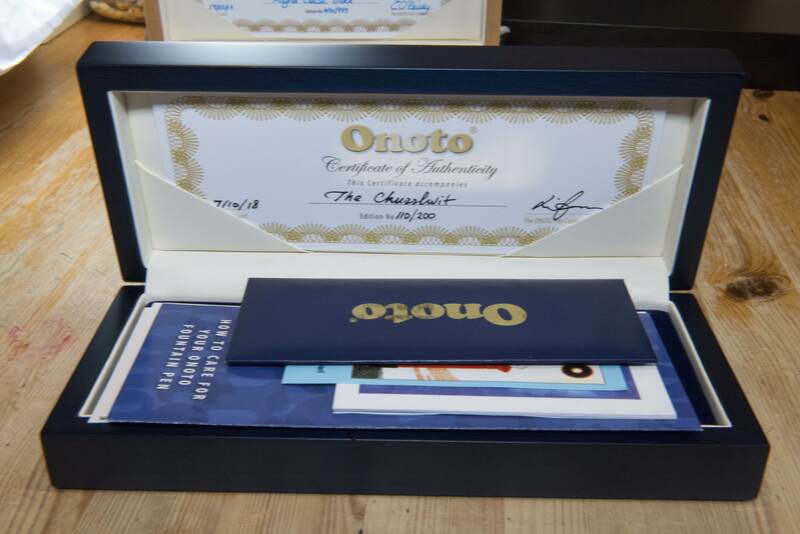 Onoto pens are not cheap, starting at just under £400 and rising to several thousand, yet they come with steel nibs as standard and you have to pay another £120-140 if you want gold. I’m in two minds if the upgrade is worth it and would urge potential buying to try both before purchasing. 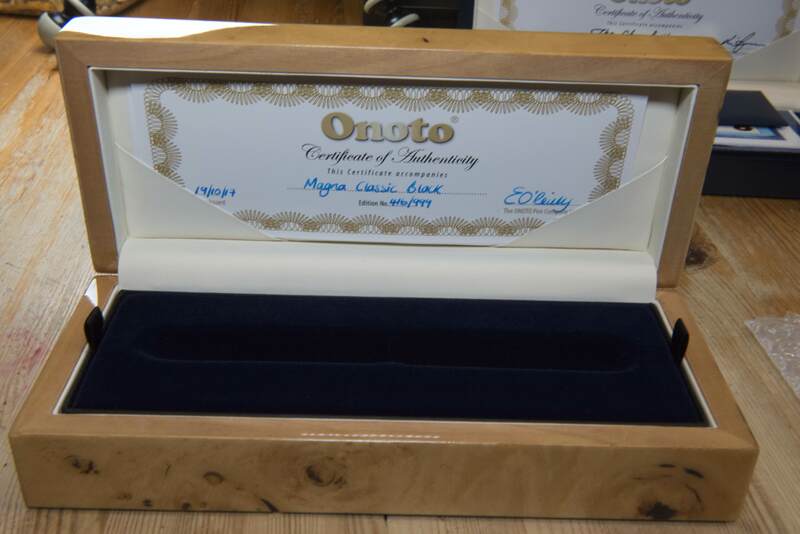 Onoto are regulars at a number of the UK based pen shows and I believe also attend a number in Europe, so potential buyers will be able to try and compare nibs (as I did when buying my second pen). Of note, the nibs come in units that can be removed by unscrewing them (and the reverse to install). 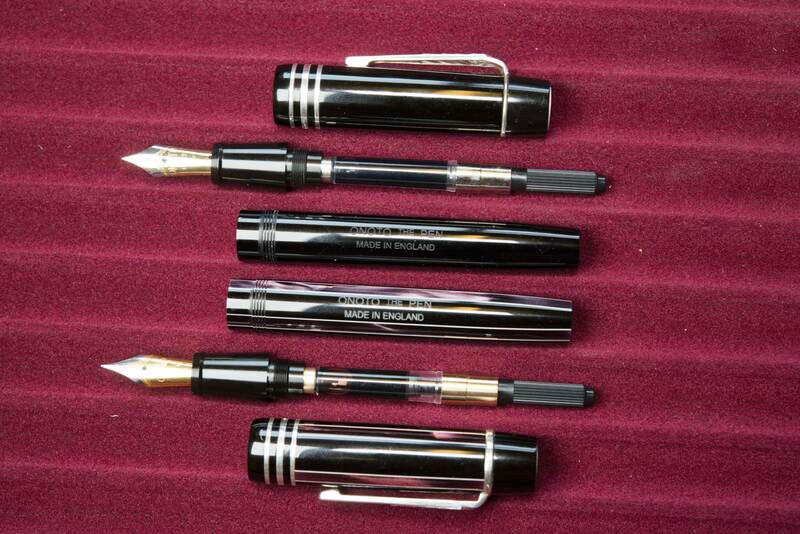 At the pen show the bock fine nib unit was replaced with the Jowo medium nib unit. I’m not sure if there are two sets of threads there (as with size 6 nib units I believe they differ), so you might not be able to swap the whole unit for another Jowo/Bock one if you want to try another size, but would need to go through Onoto themselves. All of this does, however, make the pen easier to clean. The pens come in an impressive hinged box. I’m not sure if it’s wooden or plastic, but it is very solid and impressive and has a velvet base. The external pattern/appearance changed from my fist pen to the second, but I do not know if it is random or changed over times/batches. Opened, you get a numbered certificate placed on the inside of the lid. The inner velvet base is non-removable with the blue box, and removable on the other. 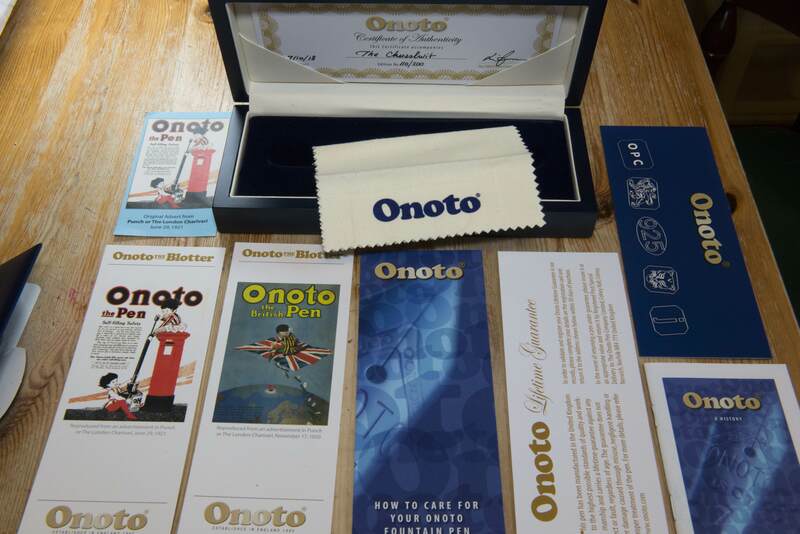 Along with the pen and converter you also get two interesting Onoto advert printed pieces of blotting card, a care guide, a life time guarantee card, a registration card, and a card envelope containing a silver polishing cloth. Note I do not know if the branded cardboard outer box on my original pen is still provided, it may only have been missing from the second pen as it was purchased at the Writing Equipment Show purchase where it had been on display. The purchase of my original pen was a risk, but it was at such a good price, and being on my futures list, I could not resist. Initially I was nervous that I had made a mistake due to its apparent size as I prefer larger/wider pens, however on starting to use it the pen felt very natural. I also tend to prefer softer nibs, but again on this pen it just felt right. 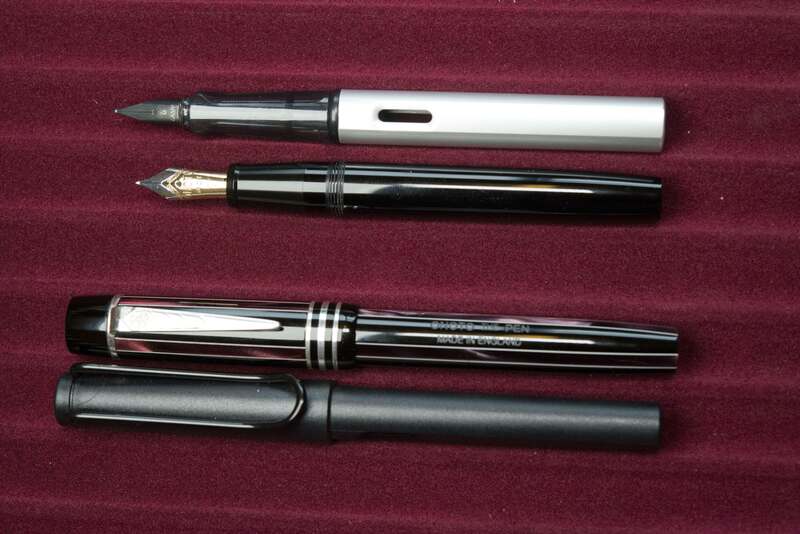 I actually describe the Magna Classic to friends as the go to pen when writing letters as it just fits the role so well and can be used for long periods without strain. 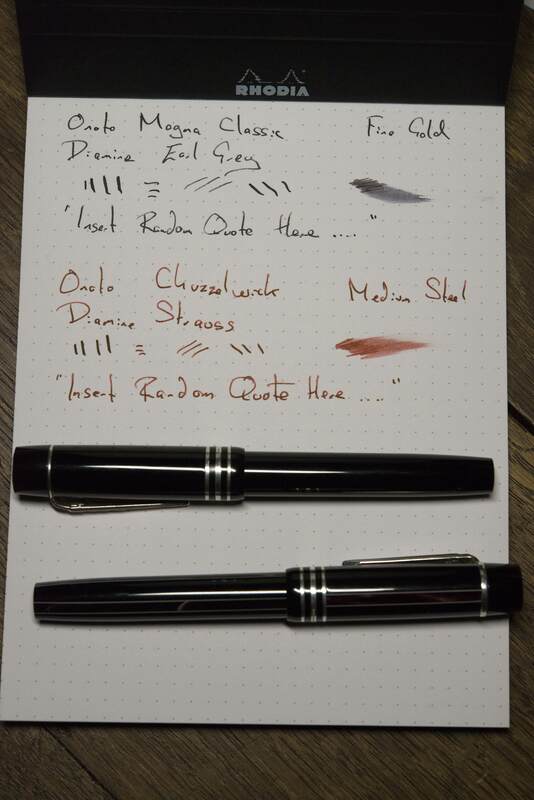 This led me to consider the second purchase before even attending the 2018 London Writing Equipment Show. 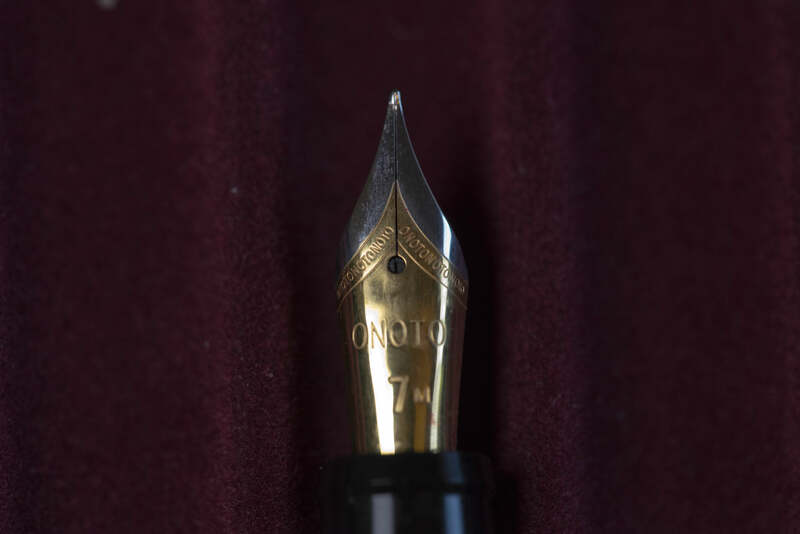 The pens are expensive when compared to their natural rivals, even before considering the extra cost of the optional gold nib, but there is something very emotive about them, which brings an odd warm feeling to the ownership experience (for me). Feels natural in the hand. Number of turns to cap (for some). Leave it to modern Onoto to misspell the name of the Dickens character, Martin Chuzzlewit! Actually it’s me 🙂 – so I’ve corrected it.